This type of locomotive was typical for the Mallets on the smaller local railways in Europe before the introduction of the axle with sideplay which enabled four or even five coupled axles in an fixed frame. Mallets were built in Europe in large numbers, but mostly in comparatively small series, before the turn of the century. By far most of them had a 0-4-4-0 configuration. 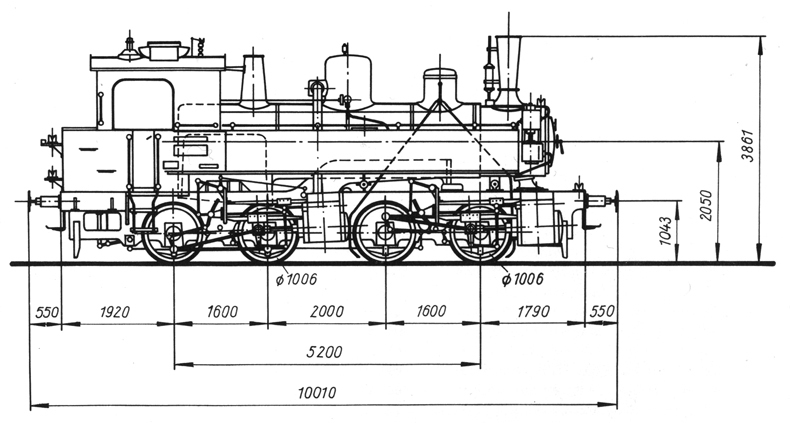 After the introduction of the axle with sideplay production of mallets, or any kind of articulated locomotive, for European railways ceased almost completely, with only few exceptions. Yes models, plural. I have two. In October 2004 I chanced upon the Reichsbahn version. Mind the exquisitely fine drive and valve gear. This model was produced by Roco. It rides brilliantly and it is fun to see both sets of finely modeled driving and valve gear move slowly and out of sync. It has one setback for lovers of articulated locomotives: it is not articulated!!. All four axles are set in a fixed frame. The front set of drivers does not swivel prototypically or for that matter, does not swivel at all. I bought this model at a model railway trade show for only 60 euro. It was without the original box and it didn't run. Opening the model was hell without the instruction leaflet, but after that I quickly found that the connecting wire between wheels and motor had snapped. Five minutes later the engine ran.